When we are searching for candlestick patterns on the chart, very often, we need to decide if a particular candle is long or short to consider patterns correctly as valid ones or not. It seems to be easy, but, in fact, what one person considers as a long candle another one may find as a short one. We need to have an objective solution to address that problem. Please note that in CandleScanner we use the term short or long line, which is an equivalent of saying short or long candle. We are using here the term short or long line as the wording short or long candle is also used in the context of the basic candles, for example, Short White Candle. Candles differ in length, which is shown in the division of the candle. The criterion for this division is fluid and depends on the current situation on the chart. The so called short line is the one where the market volatility is very low (small price range). Similarly, the long line will be the one of high volatility (large price range). The short/long line can be displayed in CandleScanner with different colors in order that they can readily be recognized. By default, the orange color is used for the short line and a green color for the long line. Knowing whether a candle is a short or long line is important to correctly recognize, and distinguish, between the many candle patterns. However, to know the details how exactly CandleScanner recognizes whether we have a short or long line is not necessary, especially for the less experienced users. It is assumed in CandleScanner that the decision as to whether we are dealing with a long or a short line, we take the whole candle into account (the body with the shadows). A common analyst’s mistake is to look at the historical chart and determine the height and dynamics of the candle, not only on the basis of the historical prices but also on future candles. However, while the candlestick is being formed we do not know the future yet, therefore, we should not use the information about the future volatility of the market. Figure 1. 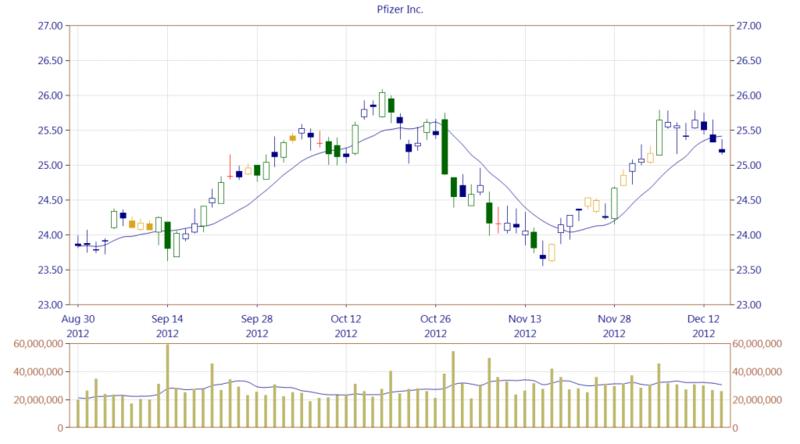 Pfizer Inc. long lines (green) and short lines (orange). Candle length depends on the current volatility of the last 25 sessions, which means that the green candlesticks may have very different spans (and still be seen as long lines). Other colors used on the chart are explained in subsequent sections. Please note that such a color theme is implemented in CandleScanner, but the user can also switch to a simple traditional two-color scheme with black and white candles (or other). Using more colors helps, for example, to accept or reject certain candle pattern as valid/invalid. The above figure shows that the green candles, representing a long line, have very different spans. For example, the September long lines are significantly shorter than those as at the end of October. But, in both cases, we are dealing with long lines, although in different market conditions. A long/short line is also known as a long/short day. The term "day" (short or long) refers to a single line of candles and derives from the period under consideration, where the charts were created on the basis of daily quotations. In the case of charts constructed on the basis of intraday prices, (for example 5 minutes, hourly or other), such a term can be confusing. For this reason, in CandleScanner the term long/short line is used to avoid any misunderstanding. Moreover, in Greg Morris’s book "Candlestick Charting Explained", such phrases as long days and short days are referring only to the height of the candle body. This is a surprising approach, because that would mean that a candle with a small body and with very long shadows would be considered as constituting a short day, indicating low volatility during the day. Therefore, it might be considered that this was some simplification on the part of Morris. To repeat, CandleScanner takes into account the whole candle height, i.e. the body and the shadows, if they exist. Figure 2. Determination of the short and the long line, depending on the average price range. The green line shows 70% of the price volatility relative to exponential average of the last 25 bars. We can notice that when the candle height exceeds the green line, it is marked as green, meaning that we are dealing with a long line. All candles whose height is below the green line are marked in yellow – these are short lines. The above figure illustrates the process of determining the short and long lines. 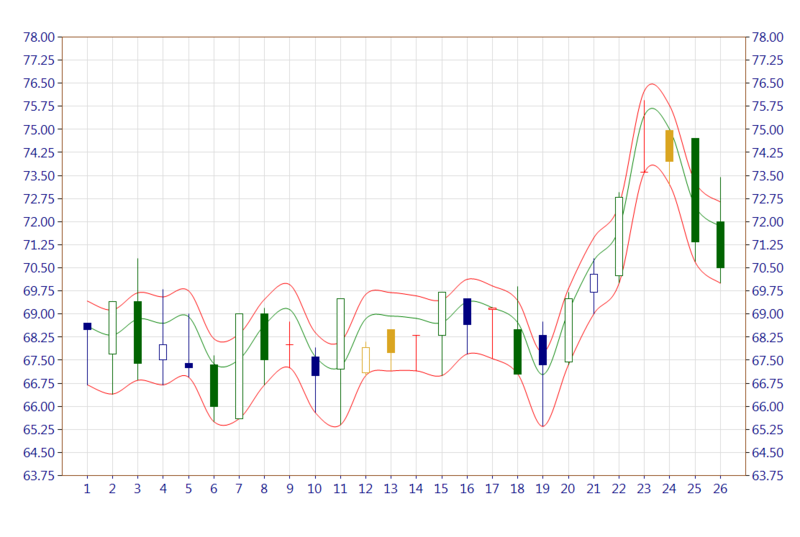 The red lines designate the average range of volatility for the last 25 candles. The green line in the middle indicates 70 percent of the range between red lines. Each candle located below this threshold is classified as a short line and marked with the orange color. Dark blue and red candles are discussed here. The red bottom line is always on the level of a minimum (low) price for the given candle. The top red line represents the volatility range from the red bottom line. Figure 3. 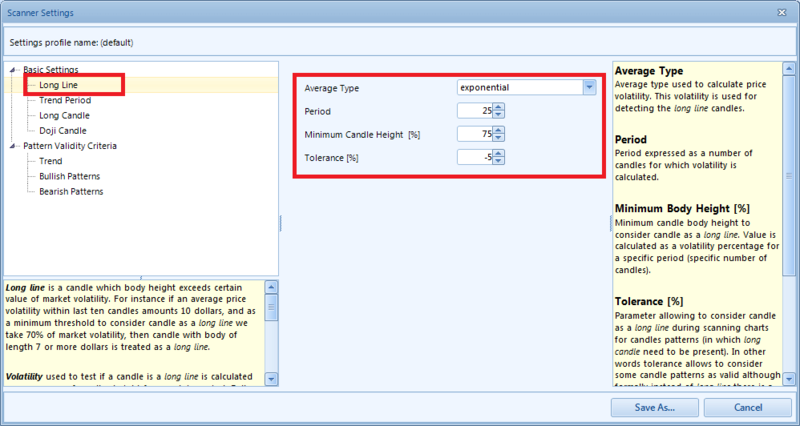 CandleScanner allows to change the settings of how to calculate the short/long lines. The parameter value of 70 percent was arbitrarily chosen. Normally, this depends on personal preference and CandleScanner allows the user to change this to meet specific requirements. Nevertheless, it is good to remember that the more we increase this parameter, the more short lines we will have, and vice versa, when we lower the value, i.e. there will be more long lines. This also has an impact on the number of identified candle patterns found by CandleScanner. Despite the discretion, we should remember that the optimal range is somewhere between 65 and 80 percent of the span. Thanks, interesting article and I look forward to your other articles. Looking forward to the final release of CandleScanner.